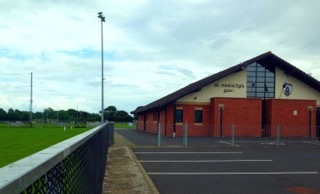 BT45 8RZ is the site of St Malachy’s, Castdeldawson, where Seamus Heaney played Gaelic football as a boy. spinach yews and silken water. wild orchids would spring from the earth and replenish what was lost. My dad is a Derry man. So was Seamus Heaney. They knew each other, not through writing, but sport. Fitting then my postcode should be where Heaney played gaelic football, a club he supported all his life. I wanted to go. I persuaded the children to come, reading them a favourite Heaney poem The Strand at Lough Beg – a violent, dreamlike poem about the murder of Heaney’s cousin. 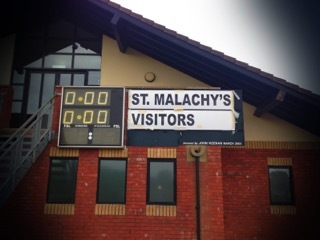 St Malachy’s is unexceptional, typical of any Irish rural sports club. The kids didn’t even get out of the car. We searched instead for the more romantic horizons of Church Island on Lough Beg, the celestial place featured in the poem and supposedly just a mile down the road. We couldn’t access it. We could see it though. Driving through narrow lanes, I stopped to ask for directions from a boy of fourteen. He wore a red and white Gaelic jersey and was clutching a writing journal. 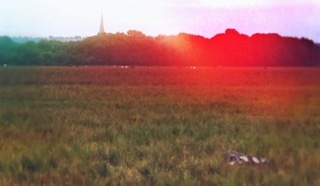 He was polite and serious, warning that if there were cattle in the marsh, it wouldn’t be safe for the children to cross. We never made it to Church Island. Instead, we met a beautiful Bellaghy boy walking in the sunlight, proudly wearing his team’s jersey, his precious words tucked purposefully under his left arm next to his heart. Lovely writing Gillian, especially the phrase “the saturnal ring of spinach yews and silken water”. Your piece conveys a wonderful sense of place. And your creation story helps provide some nice context. What a brilliant start to a fabulous project, and I can think of no better poet to begin with than Seamus Heaney. Place was very important to him. When I first heard of this project, I had half expected the BT9 postcode for Heaney’s house in Belfast to pop up. In one of the most shocking acts of literary vandalism the house in Ashley Avenue – where Heaney lived while teaching at Queen’s University – was demolished by a property developer in 2002. Much better that it is here in the county he sprang from. What a beautiful start to a wonderfully expansive project. And how lucky I was to hear Gillian’s voice reading her sestude at Wordstock 2015. I love this sestude. What a wonderful way to begin this project. I wish I could have heard you read it out loud! What a wonderful poem, supporting story and pictures. I was already excited to be involved in this project (I’m ‘up’ in February 2016) and even more excited, if a bit awed now. You have kicked us off in fine style and set the (cross)bar very high. Thanks. Thanks to everyone for your comments. It was an adventure, just as the brief had advertised. Really looking forward to reading the stories unfold.